Built to last even the toughest restaurant environments and backed by the National Sanitation Foundation (NSF) to ensure cleanliness and safety, our NSF-approved wall mounted shelving lets you make the most of unused wall space in food-service areas where storage space is always a premium. 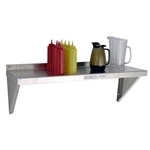 Usable in kitchens, food service areas, or even offices, these shelves help increase the usable area of your workspace without sacrificing any more footage on the floor. Ready to order and easy to assemble, your kitchen staff - and your guests - will thank you. Need additional sterile storage for your business? NSF approved shelving is also available for medical storage needs to keep valuable or dangerous products safe and secure. These solid metal shelves can be attached directly to your wall and are NSF approved so you can be confident in storing anything you need. 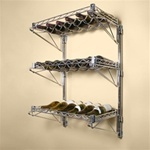 Aluminum shelving features the same great performance of stainless steel shelving, just at a lower cost. Our Wall Mounted Aluminum Shelving is available in solid aluminum or slated aluminum for aeration. Take back control of your floor space with our Wall Mounted Wire Shelving kits available in 1 shelf versions all the way up to 4-shelf adjustable versions in depths and widths that fit your every need. Adjustable units can be expanded with extra wire shelving, and our other wall mounted units can be expanded with additional add-on units. 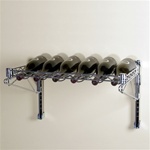 Wall Mounted Wire Shelving provides the sturdiness and ease of assembly of our standard wire shelving units while utilizing empty space on the wall where there may not be space on the floor. 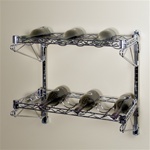 Our 14”d wine rack kits come in a variety of widths and number of shelves and are easy to install on any wall with the help of our Wall Mounted Wire Shelving Assembly Guide. 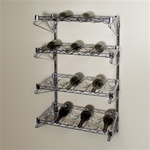 Our Wall Mounted Wire Racks are a sleek and clean way to store your wine collection out of harm’s way either at home or in your restaurant.